How to reach El Nido. If you have loads of time and don't mind spending hours at sea, you can reach El Nido by boat. There is a regular service between El Nido and Coron. Via El Nido airport. El Nido has an airport (Lio Airport) a few kilometers from the town but it's quite small and only small aircraft can land there. Moreover, the airport is mainly reserved for guests of luxury resorts. However, if you are not such a guest and if you are a bit lucky you can book free places. Flights from Manilla and Cebu. Via Puerto Princesa. Most people fly in via the capital city of Palawan. All main Philippine operators fly on this destination and it's a cheaper alternative than Lio Airport. From Puerto Princesa you can take a minivan (faster) or a bus (cheaper) to El Nido. Depending on your choice, it will take 5 to 7 hours to reach the destination. The road is quite good to Philippine standards. Transport and tours. As is the case all over the Philippines, tricycles are the most common means of transport for short distances. There are minivans for longer distances. 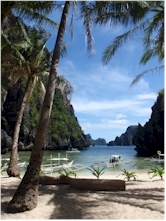 Tours can be booked in the town of El Nido. Most popular are the island hopping tours. 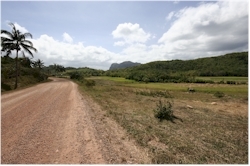 The standard tours are offered by all the tour operators, but you can also ask for a private tour. If you are on a diving tour, you will also see some of those places that island hopping tours do between your dives.